I suppose I’ve always had an interest in making telescopes, at least from the 60’s onwards. My first was a 6″ Newtonian, on an equatorial mount, all home made except for the optics, I could never get any satisfaction from grinding glass. I was employed in a tractor making factory, when such places were more than just assembly plants. There were all the old departments like toolrooms, foundries, gear shops, machine shops, welding shops, so much of the fun was in finding parts to “adjust” and places where this adjustment could be done. You can possibly see from this that I do things that I enjoy and fit work in when I have to. Now that I’m retired, I don’t have to, so I only do things that I find fun in doing. My next effort was a bit bigger, and much more fun. In 1976 the society I’d recently joined, West Yorkshire A S, decided on a project to build an observatory and a 16″ telescope. It was not just a project, more a survival plan, as we had the threat of eviction from our meeting place, an old barn near the castle in Pontefract, hanging over us at the time. Under such circumstances we convinced ourselves we could complete the task within a year. After all, how could anything go wrong? When the tasks were handed out, mine was to design and build the telescope. I’d made inspiration seeking visits to other amateur instruments, and felt the traditional Newtonian to be very inconvenient above 10″ dia., where the eyepiece had to be accessed by ladder or gantry, particularly where the plan for the observatory we’d settled on, had a dome that was entered through a trapdoor in the floor. It was to be a fully hemispherical dome above a meeting room, in the days when silo tops were the order of the day. The main guiding factor in building the telescope was that it was to cost nothing, as no money was available, all our meagre funds being sucked into the observatory building itself. Funds obtained from the usual sources then, of sponsored walks, runs, jumble sales, collections of paper, aluminium cans, etc. I was therefore forced to approach the task on the basis of adjusting the design to suit available materials, rather than looking for materials to meet a fixed design concept. As I was employed by a tractor manufacturer, I chose a German Equatorial mount, based on 2 tractor back axle assemblies as the axes. These have 2′ long x 3″ dia hardened steel shafts flanged to 9″ dia at one end (to carry the rear wheel). They run in 4″ dia taper roller bearings housed in 6″ square x 18″ long cast iron housings. All the machining was done secretly for me by the company’s apprentice school. This included machining one side of each housing to be parallel with its shaft’s axis, and refacing the shaft flanges so that when bolted together they would maintain a correct 90° relationship to each other. As new bearings don’t run as smoothly as used ones, British Timken helped out by giving me a full set of new ones run in for 200 hours on their test beds. This is how she looked when first built and ready for the Grand Opening by Sir Patrick Moore. The general design of the telescope was as follows. The polar axis housing is bolted to a concrete wedge reinforced with granite road chippings and chicken wire mesh. It was cast for us by a friend in the construction business in a mould made by Ralph Emmerson, a retired carpenter. 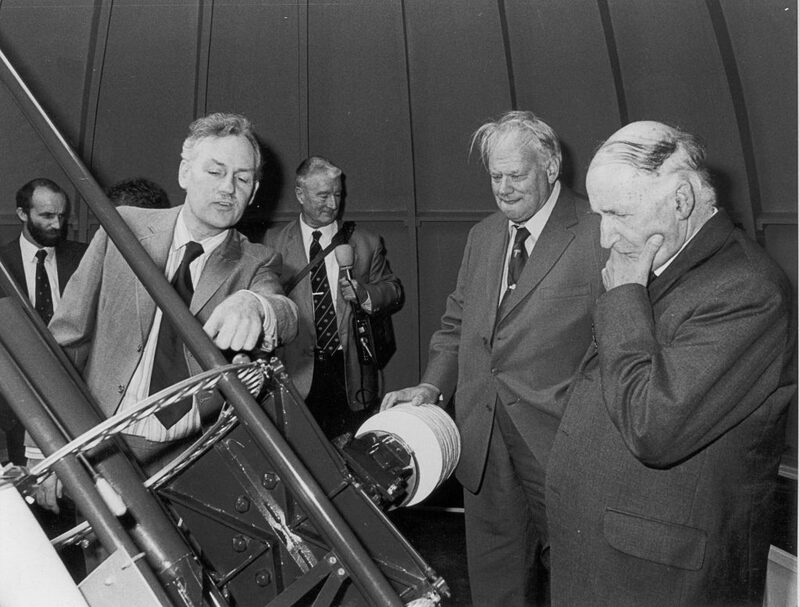 Ralph tragically died 2 weeks before Patrick Moore officiated at the observatory’s inauguration. The wedge in turn sits on 4 spherically faced jacks (erstwhile tractor parts) to allow for some adjustment in both altitude and azimuth. I should have used 3 jacks to be spatially correct but wasn’t happy that I could have got a wide enough spread with 3 jacks on the pier top to safely carry a large telescope swinging about on them. 4 is more difficult to set up but safer in the unlikely event that the instrument suddenly becomes unbalanced. 3/8″ Rawl-bolts are used to hold the wedge down onto the top of the pier which is made of sections of 3′ dia rubble and concrete filled concrete sewage pipe (donated rejects, unused thankfully) with its own foundation slab of 4′ x 5′ x 2′ thick concrete, buried 3′ below the floor of the meeting room below the dome. The concrete for this and the meeting room floor came from “passing cement mixer lorries” that had a returned load of surplus or incorrect mix. Partly pre-arranged of course, but much cheaper that way, being happy to find somewhere to shoot their unwanted load. The pier passes through the meeting room’s floor and ceiling without touching them, gasketted with sand and foam rubber respectively. Back up to the telescope proper. The declination shaft’s housing is bolted to the face of the polar shaft’s flange (where the tractor wheel would fit), and on the face of the Dec. shaft’s flange is bolted a deeply ribbed welded steel cradle. This carries the skeletal tube which consists of 6 off 7′ long x 1¼” steel tubes (donated stock), held in 4 off 23″ dia steel rings. The tubes are secured in the rings by grub screws and industrial adhesive. The 2 middle rings locate in channels in the curved end sections of the cradle and are retained there by 1/8″ dia stainless steel wire cable (formerly sailing dingy halyards) running in a groove in the rings’ outside diameter, and tightened into place by bicycle front wheel spindles and hand nuts. Slackening the cables allows the tube to be rotated to position the eyepiece for convenience. Similarly, the focusser sitting on its aluminium plate can be clamped between any two adjacent tubes. Though they did work when first made, in practice we have never needed to use either method, as the Nasmyth optical system brings the focus conveniently to the Dec. axis where it can be used without aids by all but the smallest visitors, which, after all, was a major reason for choosing the system. The tube’s rings are made from 2″ wide x 3/8″ thick steel strip rolled into a ring, welded, turned, grooved and drilled for lightness and reamed for the 6 tubes. All produced free by the apprentices of a friendly machine shop. The optical system was produced for us by Henry Wildey, a very experienced and famed amateur maker of mirrors, objectives and eyepieces. He charged us £500 for the 3 items that constituted our Nasmyth optical train, an 18″ parabolic primary, an hyperbolic secondary and a 2″ minor dia flat. The primary was made parabolic in case we wished to convert to a Newtonian later (we bought a suitable secondary for that purpose some years later and made a second focusser plate but soon returned to the Nasmyth system’s convenience and safety). The increase from the planned 16″ to 18″ came about because Henry Wildey indicated that he just happened to have an 18” plate glass blank about his person, and would have no more difficulty in producing an 18″ primary than a 16″ one nor would it cost much more. The basic design was unaffected as the axes could easily handle the increased spread and weight. Our primary is 1½” thick rather than the accepted 3″ (1:6 ratio). But we most certainly couldn’t have produced the telescope had I followed convention as I was being pressed to do from all quarters at the time. The conventional wisdom was to be departed from at your peril in those days. Earlier discussions with Henry Wildey had however, supported my belief that the principle was firmly based and could be successful, and when you are young and have little choice you take adventurous risks. Failure would support all the “I told you so’s” and leave us without an instrument, and in fear of trying again except along conventional lines and we wouldn’t be able to afford that. Convention required that zero or low-expansion materials be used, so as to prevent the figure from varying. My view was that rather than prevent the figure changing, let it change but get it back quickly, as the mirror’s figure is lost only while it is actually changing temperature. When ambient is attained, the original figure is regained. A thin mirror held in a multi-point open cell in a skeletal tube allowing air to circulate freely, would pass through the temperature change between day and night much more quickly, and attain night ambient in time to be usable within a short time after opening the dome. The dome is lined with polystyrene foam and painted a sun-reflecting white to help reduce the primary’s temperature amplitude. All this was very avant-garde in those days and I was made to feel very much on my own. Following this gamble, allowed us to use the very much cheaper plate glass and keep the cost within sight. Pyrex or Zerodur were prohibitively expensive. This and the choice of a Nasmyth optical system were the pivotal decisions in the design, both very un-conventional at the time, but happily both have proved successful. The tube, as mentioned, is skeletal to help the optical members get to ambient temperature quickly. The mirror cell is an 18 point open design. All its various plates and levers were hand cut and bent to shape from 1mm steel sheet. All its pivots are “ball and socket” joints, the balls of which are valve tappet adjusting screws from tractor engines (where else) and the sockets are the female part of large brass press studs found on many denim jackets and windcheaters (perhaps this was taking “design to suit available materials” a bit far). Each leg of the mount’s 3-legged main frame (made from stiffened 2″ square steel GPO electrical trunking) ends in a 5/8″ dia eyebolt (haybaler plunger adjusters) locknutted into the bottom tube ring for collimation. Both the spiders have 4 triangulated legs, each made from 2 pieces of 1″ wide by 1/16″ thick steel strip, supporting central tube arrangements that carry the secondary and tertiary, again all hand made. 4 because of the likelihood of generating 6 diffraction spikes if 3 legs were used. 2 legs would not be stiff enough. A telescoping facility was built into the secondary spider to allow it to be used for additional focussing capacity. This was accomplished by means of rods and Meccano gears. At this point my confidence gave out and rather than bodging the rest of the equipment we needed, I made out a shopping list. In the late 70’s there were very few reliable places in England that supplied things astronomical. The list consisted of a steel worm and aluminium wheel with a synchronous motor and gearbox for the Polar axis, a pair of aluminium setting circles, a 10 x 50 finder and a 2″ focusser, bringing the total cost with the optical train to £755. The Dec drive was a 10” tangential drive powered by a hand screw and was made by a member’s father. The telescope was designed and built in the 70’s and finally opened in September 1983 (it sat in my garage 2 years waiting for the observatory to be completed). 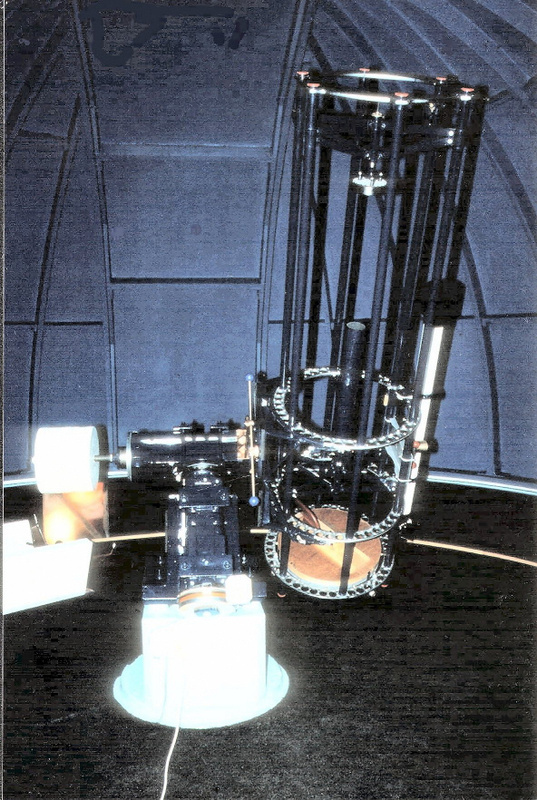 The next telescope was a Dobsonian for the same society, for sale to a member of the public. I donated and used the same mirror I’d used in my first Newtonian, a very good mirror indeed. It was a standard (then) 6″ of 48″ focal length and netted the society about £200. The final one, which I still have, is another dobsonian of 6″ diameter, but using a mirror of 26″ focal length made for me by a friend who now lives in France. Both his society, the Huddersfield, and mine, the West Yorkshire, have thrown out our old telescopes, both made in the 70’s, in favour of modern goto Meade SCT’s, the Huddersfield chose a 16″ bought through a past member’s bequest, and West Yorkshire chose a 14″ obtained through a grant. He, Philip Pendred, was able to take their old 16″ with him to France, but the West Yorkshire retained the optics of the one I built, choosing to have them made into a Dobsonian, of less than perfect mechanical design, though I’m told it does actually work. Phil’s 6″ mirror makes the little Dobsonian a very comfortable rich field telescope. Since my retirement, my interests have turned more to taking pictures, and I use the equipment seen elsewhere on this site. Brian passed away Dec 27 2017.